Thank you for looking at our registry! 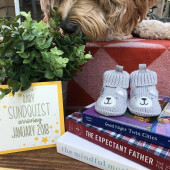 We appreciate any contribution towards helping Baby Sundquist feel loved and welcomed. We are using BabyList because you should be able to buy the item anywhere (Amazon, Target, Kohls, etc) and still be able to mark it as purchased. Many of our items can be used from infancy through toddlerhood! Other items we may not use long, so we are happy to accept used items, if they are in excellent condition. Again, thanks for all of your support and we cannot wait to celebrate our growing family!